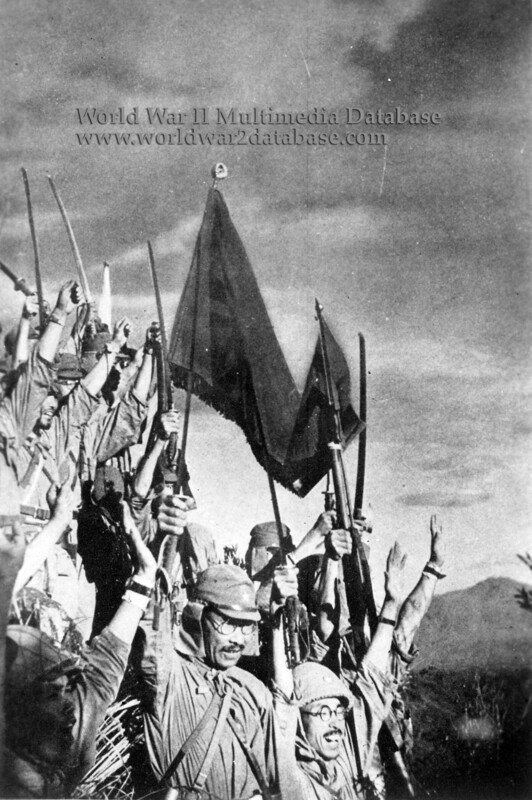 Imperial Japanese Army soldiers, probably of the Nagano Detachment, cheer the capture of Orion, Bataan, sometime around April 9, 1942. Orion, on the shore of Bataan facing Manila Bay, formed the east anchor of the main line of resistance opposite Bagac on the western shore. After falling back from from Layac Line in early January 1942, the Abucay Line on January 22, and the Mauban Line after that, the United States Army Far East (USAFFE) established the Orion-Bagac Line in late January. Japanese thrusts in February 1942 occurred even before the defensive positions were completed. The offensive was contained and destroyed in battles known as the "pockets." Few Japanese escaped back to their lines. Imperial Japanese Army General Masaharu Homma, commander of the 14th Army, was forced to ask for reinforcements. A lull in the fighting resulted; during that time USAFFE food and medicine supplies dwindled and both the soldiers and the civilians began to starve. During the latter part of February and throughout the month of March Japanese reinforcements poured into the Philippines. Orion, in George Marshall Parker, Jr.'s (April 17, 1889–October 25, 1968) II Corps area, was defended by the 31st Infantry Regiment of the Philippine Army (PA) in Sector A from the beach to 2,500 yards (2300 meters) inland, and by the American Provisional Air Corps Regiment made up of ground personnel from the Army Air Forces in Sector B just southeast of Orion. Japanese forces launched an attack against the Bagac–Orion Line at 0900hrs on April 3 with a massive artillery barrage. Homma hoped the six-hour barrage would smash American defensive positions and artillery batteries.On April 4, 1942, Homma alerted Major General Kameichiro Nagano's Detachment of the 21st Division to prepare to assault Orion. The Japanese infantry and armor moved out on the heels of the artillery preparation, hitting the Filipino troops before they could recover from the effect of the shelling. First to cross the San Vicente River was the Nagano Detachment which, at 0730 Hours, struck the 32nd Infantry (PA) on the right of Sector C west of Orion, then turned east to strike the Provisional Air Corps Regiment in Sector B. Supported by tanks, Nagano's men advanced rapidly into the area held by the grounded airmen who, lacking antitank weapons to oppose the armored point of the attack, fell back without a fight. The 31st Infantry (PA) in Sector A withdrew in disorder after a heavy air and artillery attack, leaving the Japanese in control of the last remaining portion of II Corps' original main line of resistance. On April 7, General Jonathan M. Wainwright, on Corregidor and commander of the United States Forces in the Philippines (USFIP) ordered General Edward P. King Jr. (July 4, 1884 - August 31, 1958), in command on Bataan, to counterattack and regain the Orion-Bagac Line. General King regretfully had to disobey the order as his men were not only starved and out of medical supplies and ammunition but he no longer had any room to maneuver. King's soldiers were demoralized; counterattacks failed and without antitank weapons, Allied units withdrew south. General Douglas MacArthur, exercising overall command from Australia, urged I and II Corps to counterattack, and Wainwright transmitted those orders to King. It was too late. At 0300 Hours Colonel Everett C. Williams (May 9, 1891 - June 20, 1972) of the 45th Infantry (PA) and Major Marshall H. Hurt, Jr. (June 26, 1908 - April 3, 1945) volunteered to go forward under a white flag to request an interview for General King with the Japanese commander. This photograph was from a newsreel still that was probably taken after the surrender. Later, this image appeared in Hito Hakengun ("Philippine Expeditionary Force") a publication celebrating the Japanese victory.